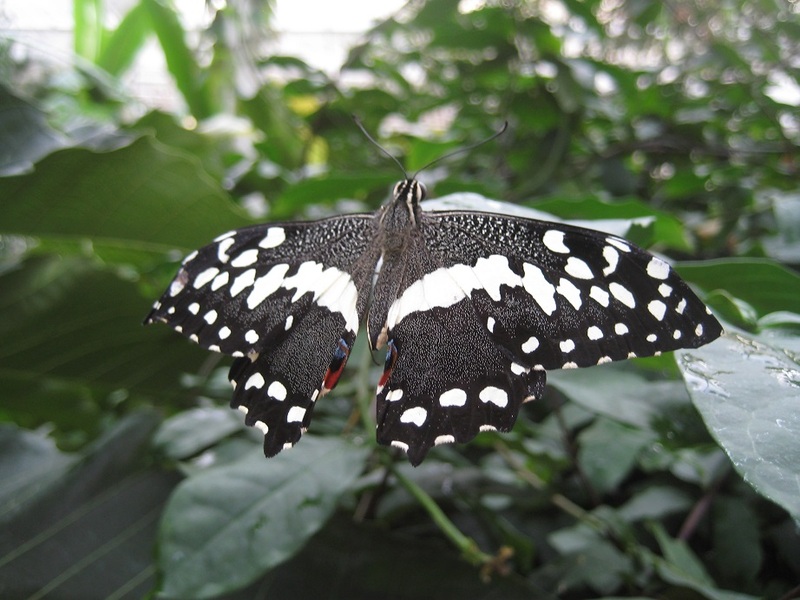 In January and February, tropical butterflies fly free in the glasshouse at RHS Wisley Gardens, and we went to see them. http://www.rhs.org.uk/gardens/wisley/whats-on/butterflies-in-the-glasshouse We were queuing outside before opening time, were first through the gates, and made it into the greenhouse before it officially opens at 9:30. This gave us about 20 minutes in relative solitude in the warmth – oh, it was so nice and warm! – before the greenhouse began to fill with families and photographers, all there to see the butterflies … and one of the two (grass?) 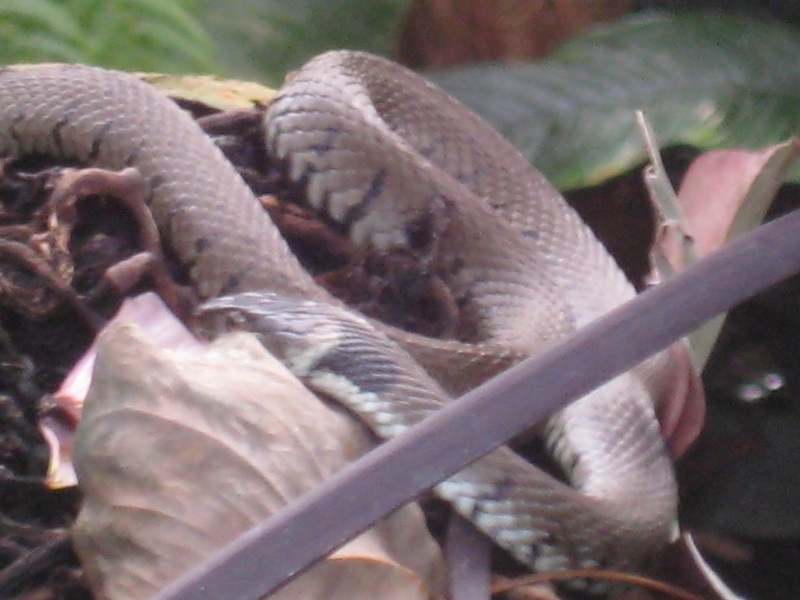 snakes and a robin that have also set up home in there. By about 10:30 we left Wisley and, about a mile up the road, stopped to look for the Church Micro cache at Wisley church. http://www.genuki.org.uk/big/eng/SRY/Wisley/WisleyChurch This is a tiny Norman church tucked away behind farm buildings. It would be easy to pass without noticing. The cache was supposed to be at the back of the church, somewhere along a fence. We arrived at the spot the GPS said was the location, and started looking. And looking, and looking. After a few minutes we had to break off to ‘admire the snowdrops’ as a muggle and dogs passed by. We restarted looking, and looking … there were only a finite number of places along this fence that the cache could be. Where was it? On the third / fourth /fifth pass along the fence we turned something over, and there was the cache after all. Phew, we were about to give up. 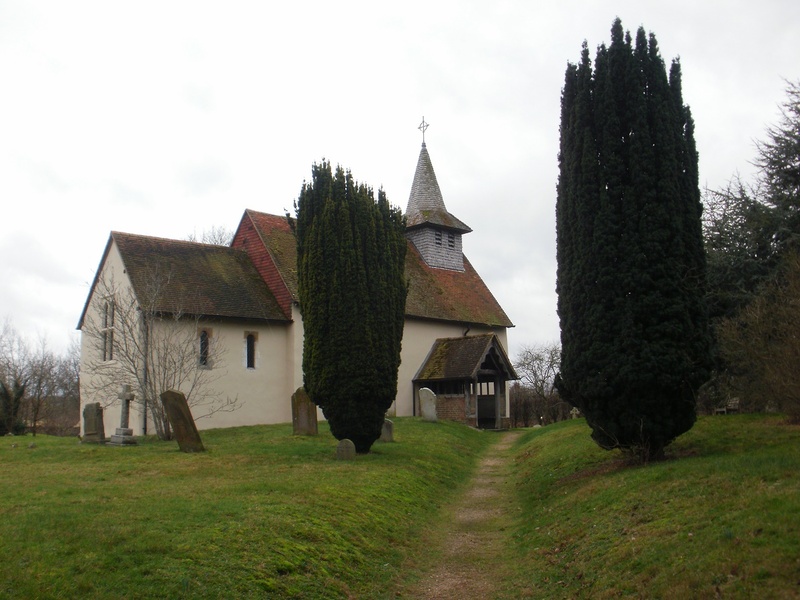 These two CMs – Wisley and Pyrford – are ten years old, number 53 and 54 in a series that now stretches to over 11,000 caches, and is the largest geocache series in the world https://thegeocachingjunkie.com/2016/05/31/church-micro-the-worlds-largest-cache-series This particular CM was a multicache, where we had to assemble information from items near the church. One stage involved the war memorial, just outside the church gate, and the other was about counting the fish carved on a stone seat, just inside the gate. ‘Cod’ we work out how many fish there were? No, we ‘rudd’y well couldn’t. We came up with some possibilities and took shelter in the church to work out some ‘plaices’ for the cache. We came up with three possibilities and set off up the hill to check them out, striking lucky at our second attempt. ‘Brill’! It was moved in the 1970s when the road was widened, and it is reputed not to be happy about that, and it moves around at midnight, contributing to road accidents. Or so they say. This was another multicache, and we derived various numbers based on the plaque which describes the stone. Another short walk to the final location followed, yielding a large cache where we dropped off the ‘Mr Heyday’ trackable we found just after Christmas. 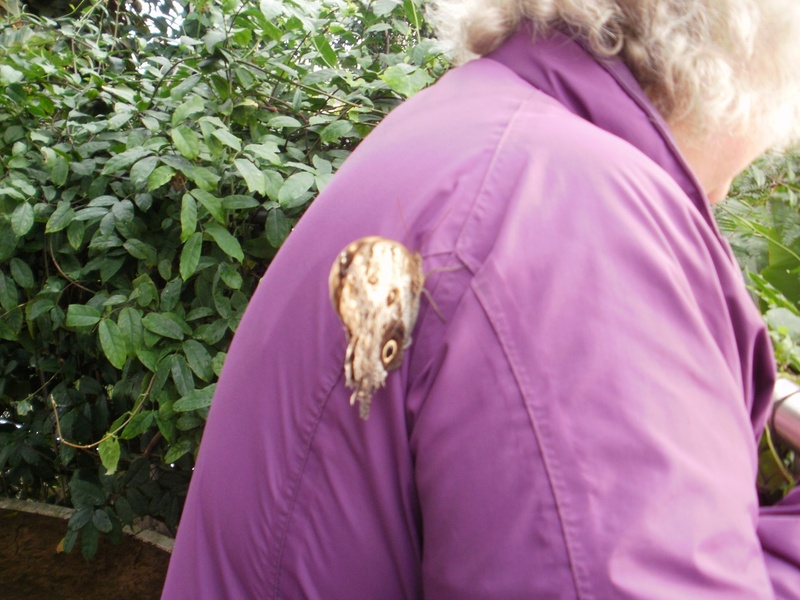 That finished off a morning of contrasts – ephemeral butterflies, ancient churches, and an even older stone. Time for lunch! 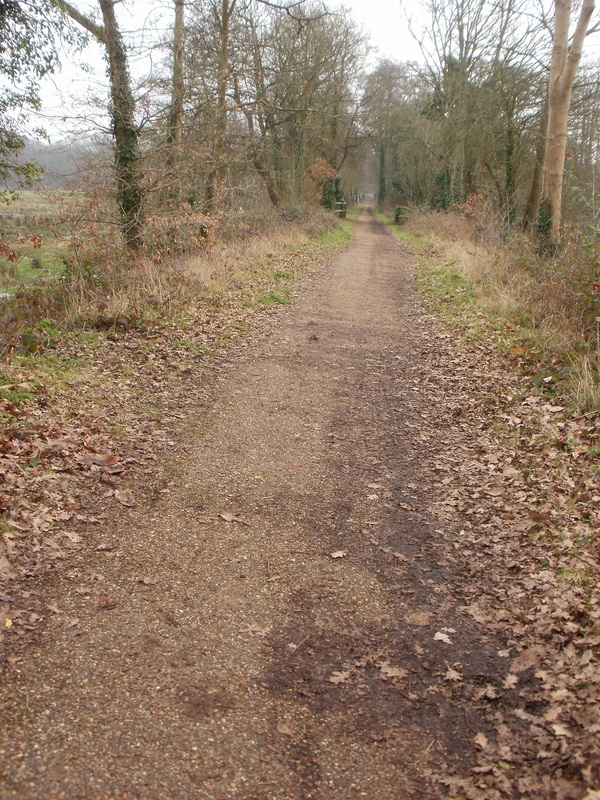 We resumed our walk from Sandhurst (Berkshire) to Sandhurst (Kent). We were away from train lines, with no obvious bus route or other transport between the two ends of the route, so we planned to park a car at each end, then to walk between them. Simple, but the car shuffling does take time. 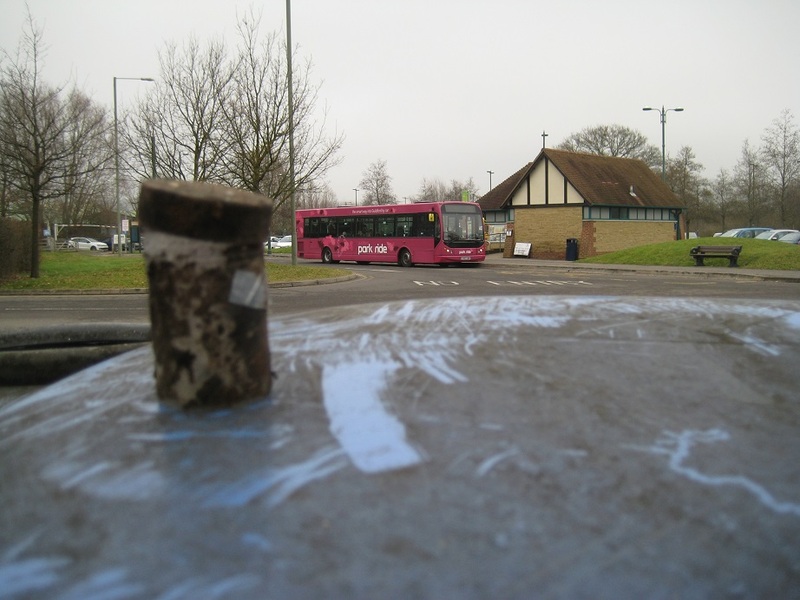 This meant we could start the day with a first cache at the Park & Ride south of Guildford, overlooked by curious shoppers catching the bus into town. Rejoining our past trail, we set off south on the banks of the Wey at St Catherine’s Lock, on a cold and misty morning. 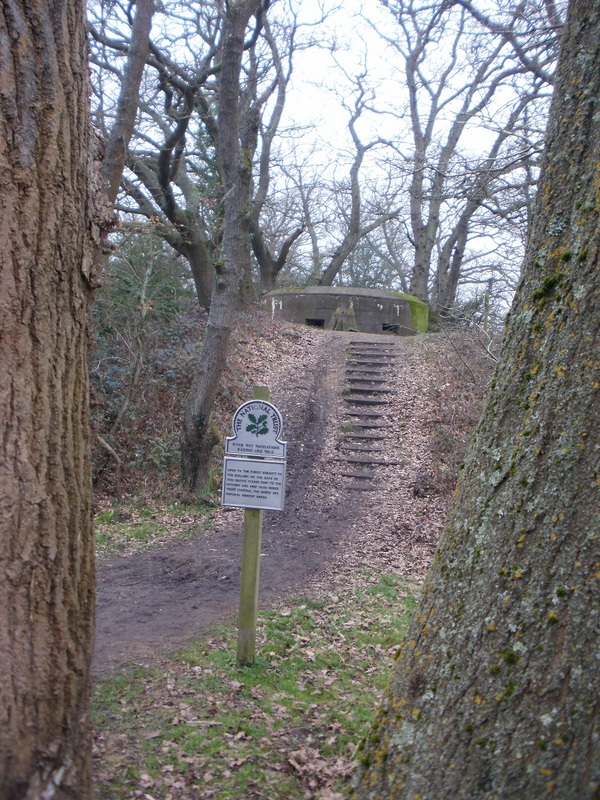 A round pillbox on a little knoll overlooked the river and the railway beyond and we climbed up to look in and around it, then scrambled around on the bank to find the cache hidden nearby. A little distance on we passed the boat moorings in the entrance to the derelict Wey & Arun Canal, then left the river to join a disused railway line, now part of a long-distance path, the Downs Link Way https://en.wikipedia.org/wiki/Downs_Link , which runs from Guildford all the way to Shoreham-on-Sea on the coast. It meant level, well-surfaced walking for a few miles, but only an occasional cache to distract us. To break up the long, cache-free section, we added in one extra cache, up a busy and pavementless road, from the ‘Fine Pair’ series (a post box and phone box in view of each other, an interesting but increasingly rare series as phone boxes disappear). Back on the railway track, all was peaceful … Suddenly, a muddy mountain biker sped past us … then another … then another two … then some more. Oh dear, we hadn’t unwittingly stepped into some sort of charity event, had we? 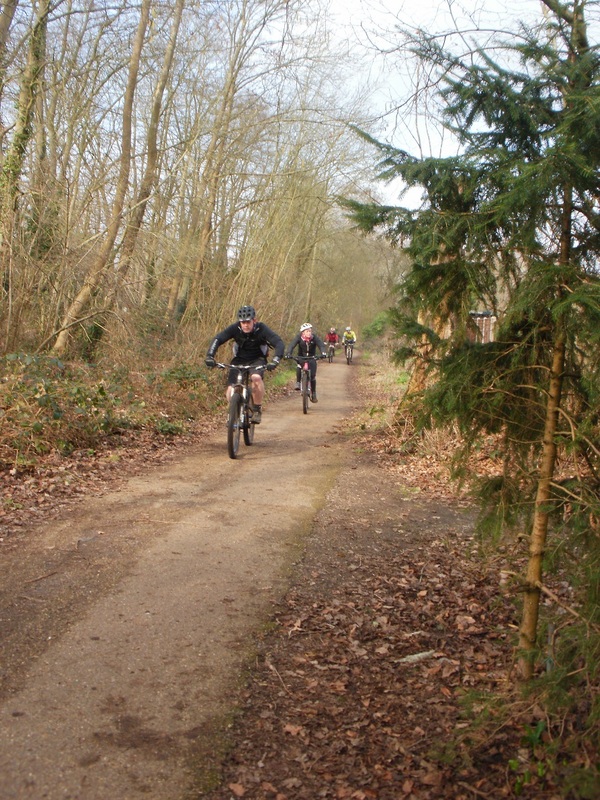 It turned out that we hadn’t – it’s a well-established trail ride – http://www.trailbreak.co.uk/bramley-trail-ride – and the riders were respectful of the many other path users. 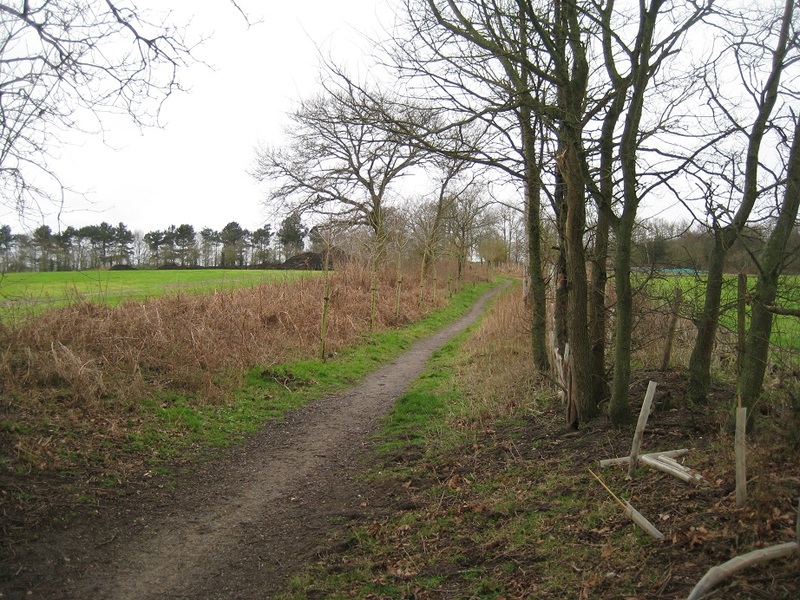 The end of the trail ride was at Bramley. This was also our lunch stop, and a chance for us to search for (and find) two unusual multicaches (those with multiple stages to the final cache). The first was one from the ‘Church Micro’ series. We had a quick look at the church, but didn’t hang around as people were gathering for a 70th birthday party. 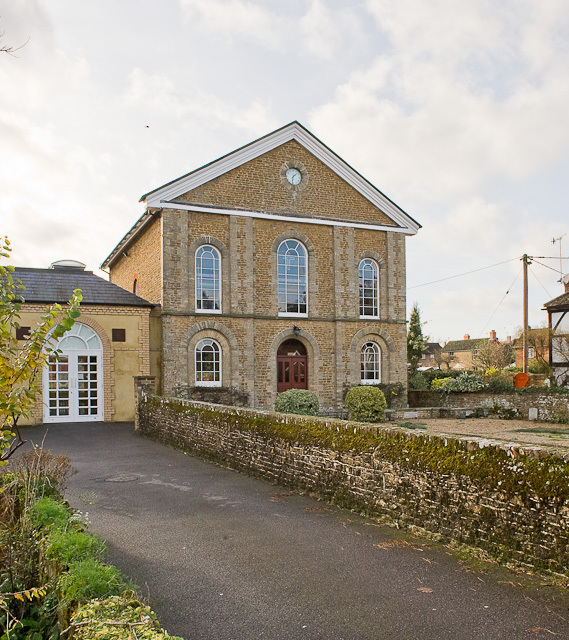 Instead we moved off to a seating area nearby – once the village animal pound – where there were seats and we could eat our lunch and solve the Church Micro. The early mist had now disappeared and it was a bright warm spring day, with daffodils and crocuses sprouting. 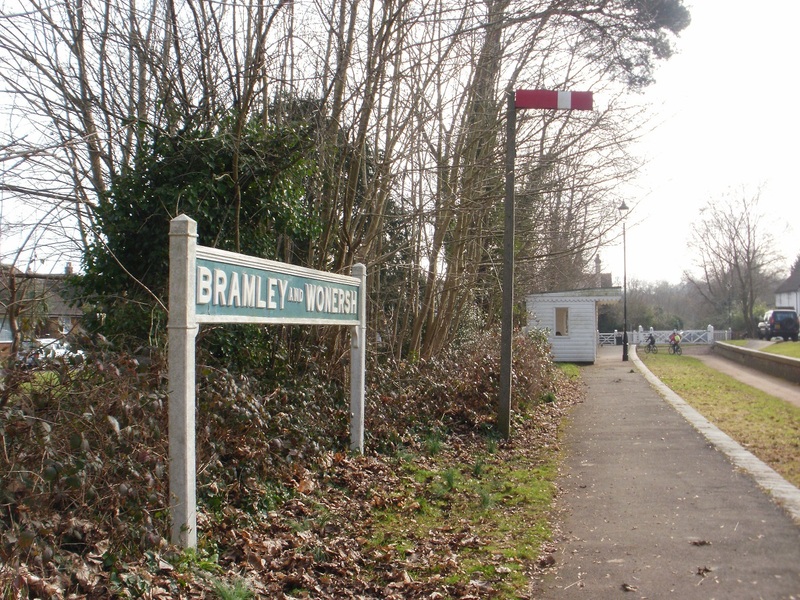 And there had been another multi cache based on Bramley and Wonersh station. We collected the numbers for that and solved that too. 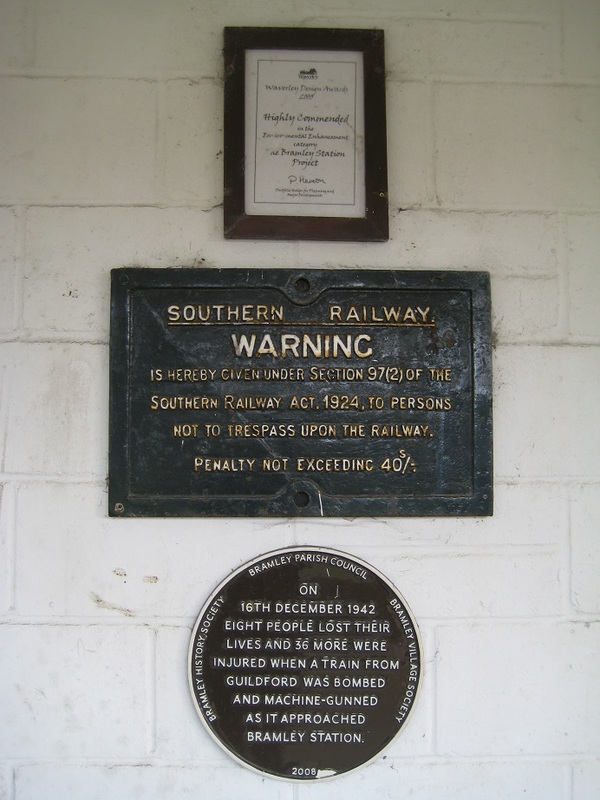 The station is now disused, as the line was decommissioned during the Beeching cuts in the 1960s. And before that, the station had come to notice during World War 2 when a train was bombed and lots of passengers were killed or injured http://www.bbc.co.uk/history/ww2peopleswar/stories/70/a3379070.shtml That’s another bit of local history I wouldn’t know about without geocaching. Picnic lunch eaten, we set off to find the final locations of the two caches. One was the neatest, tidiest cache we had ever seen; even the sticks covering the cache were regular, even, and tidy. And the second cache was the newest we have ever found (so far) as it was only placed 12 days before we found it. Good result; we usually do very badly indeed with multicaches: our options for failure multiply exponentially as the number of steps increase. 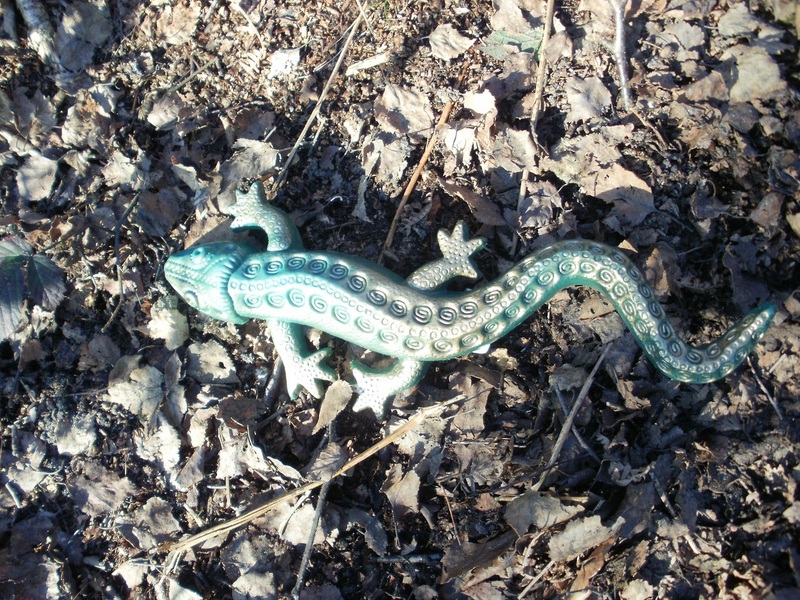 We were headed for Shamley Green, and as we approached, we started to find caches from the SGB series (Shamley Green Bipedal-motion). And there was a great place to stop for an afternoon coffee, on a sunny seat by the church, not far away from the matching Church Micro cache. 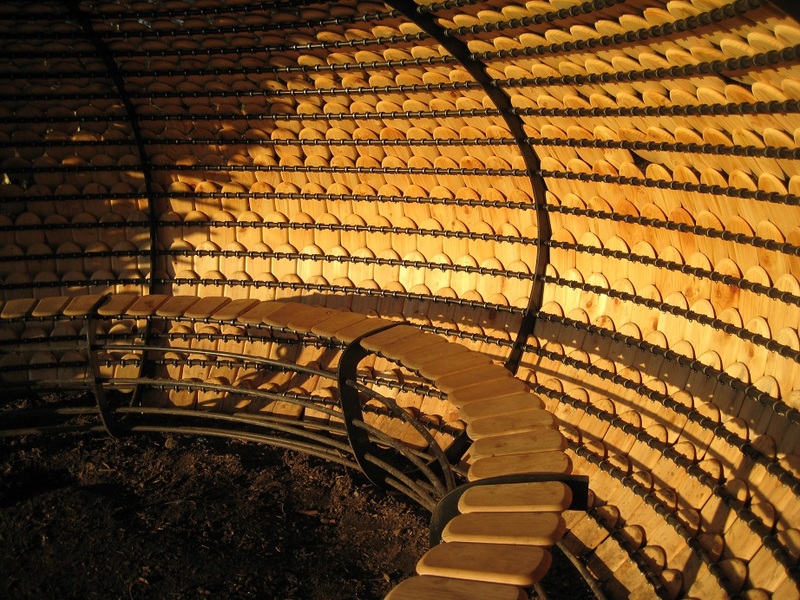 We walked on along the ridge, and suddenly came across a structure that resembled a curled-up pangolin. We looked and wondered, and did some research later. 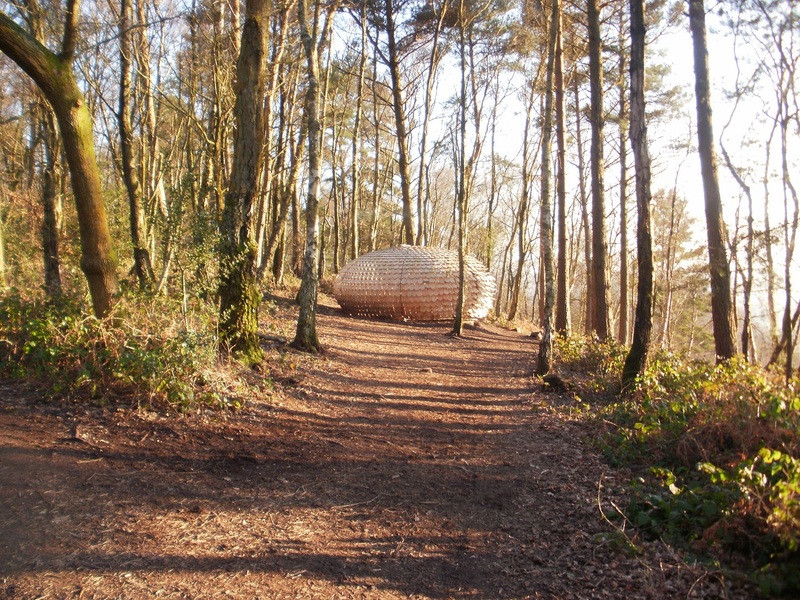 It’s called ‘Perspectives’ http://gilesmiller.com/artworks/perspectives A steady stream of muggles appeared through the woods to visit the peaceful spot looking out from the ridge. By now the sun was near the horizon and it was noticeably cooler. We walked the remaining mile to the other car, set about some reverse car shuffling, and headed home in the dusk. 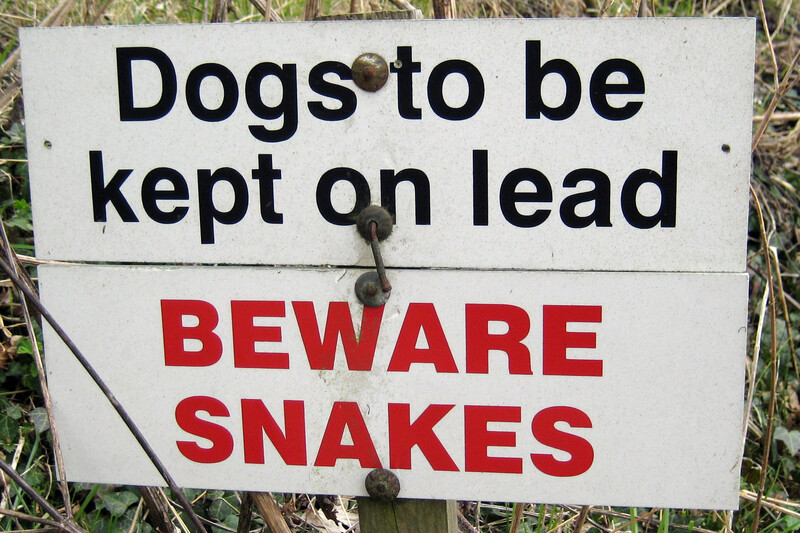 A most interesting and varied walk! Once again we were out and about on a Friday evening, ready for Mr Hg137 to give another talk on the South Downs Way to a local club; we are getting quite practised at this; he does the talking and I do the techie stuff with laptops and projectors. Just in case we got lost (that was our excuse, anyway), there was a geocache nearby, as well as a couple along our route. In case the Friday evening traffic was heavy, we had allowed plenty of time for our journey. But that was not the case, and we arrived at the first cache location with about 45 minutes to spare, and just a couple of miles left to travel. So there was time for caching after all … we parked in the car park just behind the church, Woodham All Saints, then spent a few minutes rootling around in the bushes, before realising that the cache wasn’t going to be on church premises, it was going to be somewhere along the footpath that bordered the church. 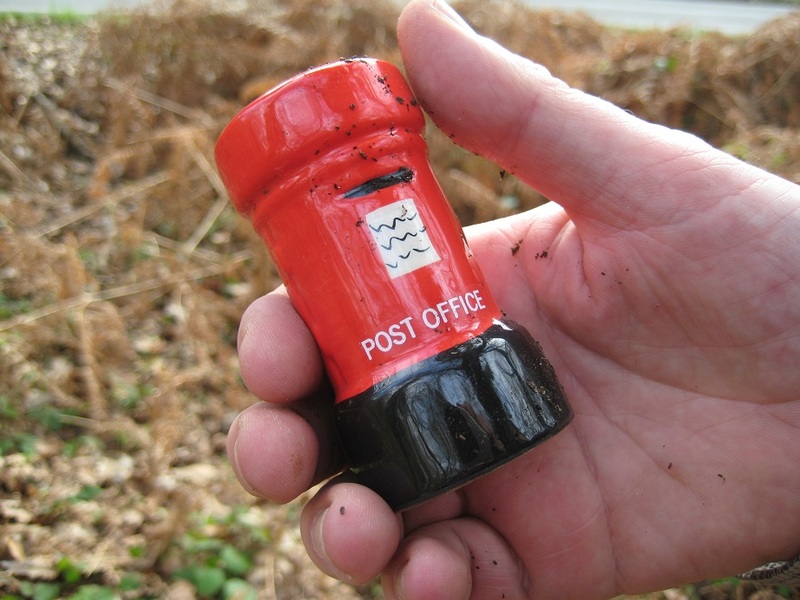 And so it proved; Church Micro 61 was ours, and the lowest numbered (ie oldest) that we had ever found; the series now numbers over 9000 caches. 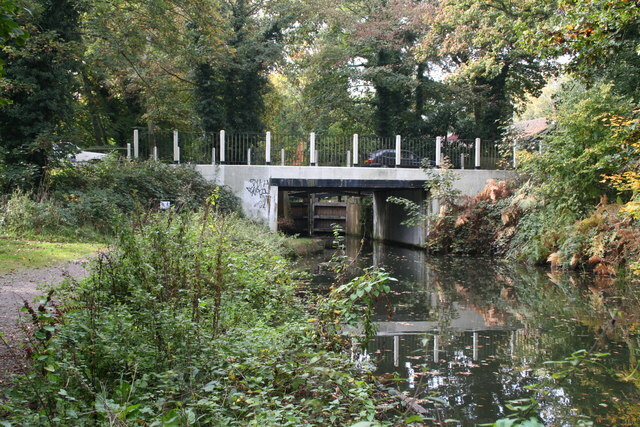 Back into the geocar, and closer to the venue, we turned aside to park in a side street close to the Basingstoke Canal. 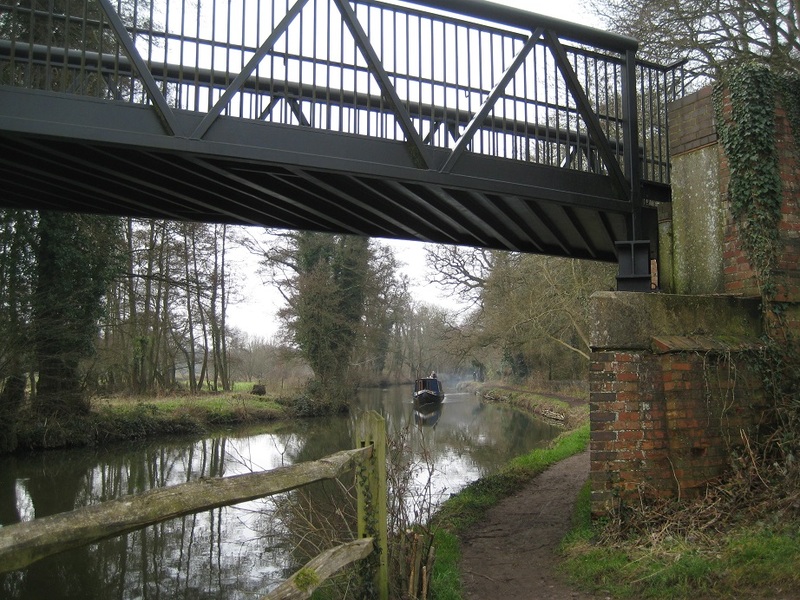 The second cache was called ‘Two Bridges’, and was somewhere near the canal and lock. Try as we might, we simply could not get the GPS to decide on a location, time passed, and we wondered whether to give up and move on. We read the logs from previous finders and pondered … then took the GPS advice on location, got fairly close, and then found the cache based on the information in the logs. Time was definitely passing now, but we still had a few minutes, and the third and final cache of the day was another Church Micro, number 8587, which was within sight of our final destination. This cache was easier to find, hidden in some street furniture over the road from the church. Then it was time for the main business of the evening, and another successful talk was delivered. The only odd facet to the evening was the way the power to the projector cut off every time an outside door was opened … something to do with the alarm system … but it caused me, as ‘roadie’ and technical support, quite a bit of angst! 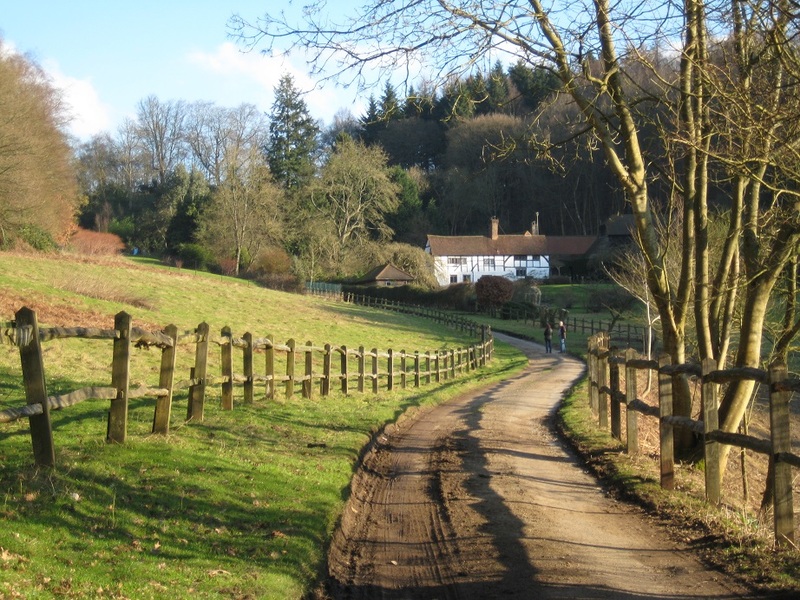 We were in Elstead, a pretty, pleasant, and prosperous village in the Wey valley in Surrey, on a Monday evening, ready for Mr Hg137 to give a talk on the South Downs Way to a local club. 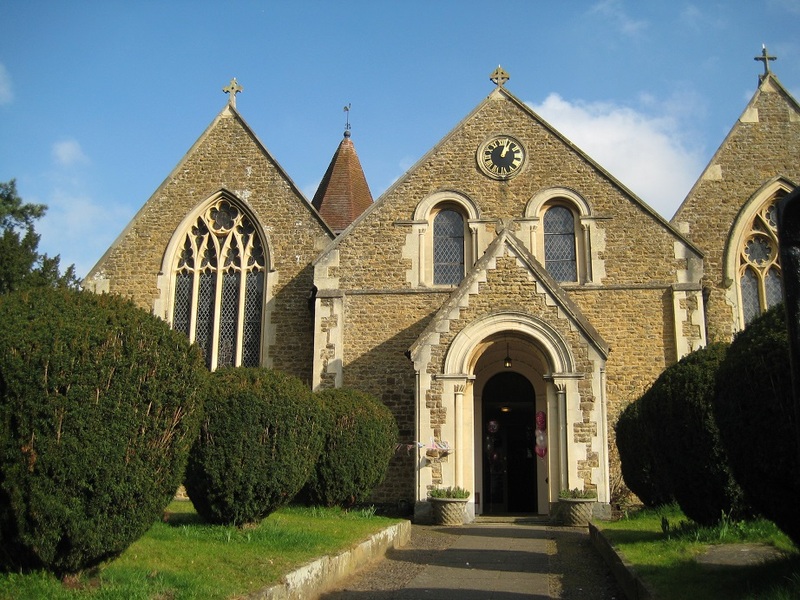 Handily, the venue had its own geocache – Church Micro 7006…Elstead – URC – so we strolled over the road, made the find, and still had loads of time to set up for the presentation … which went down very well indeed. 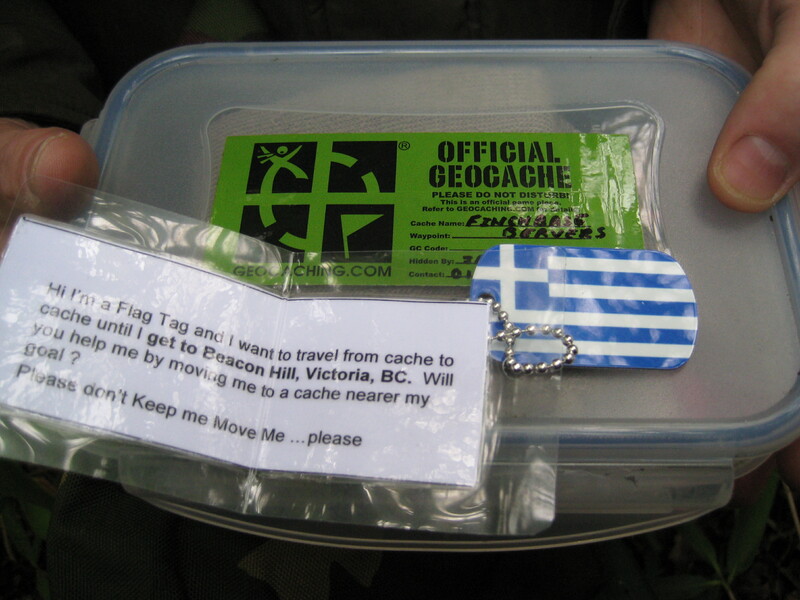 •	It is the largest geocache series anywhere in the world. On 25th April 2016 there were 9,634 published Church Micros, of which 8,407 were active, 100 disabled and 1,127 archived. They were placed by 1,782 different cachers. 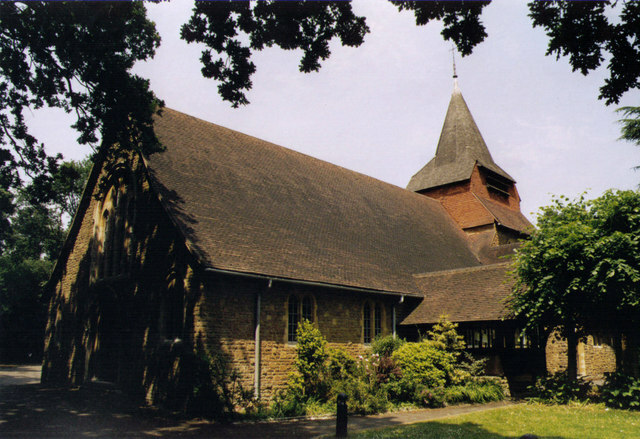 •	Top Church Micro finders are Woking Wonders, who have found over 5,000 Church Micros so far. We talked to them at a cacher’s meet a while ago, and they said they were now having to travel as far away as 150 miles from home to find new Church Micros. It’s probably even further by now. •	We have found 38 Church Micros. 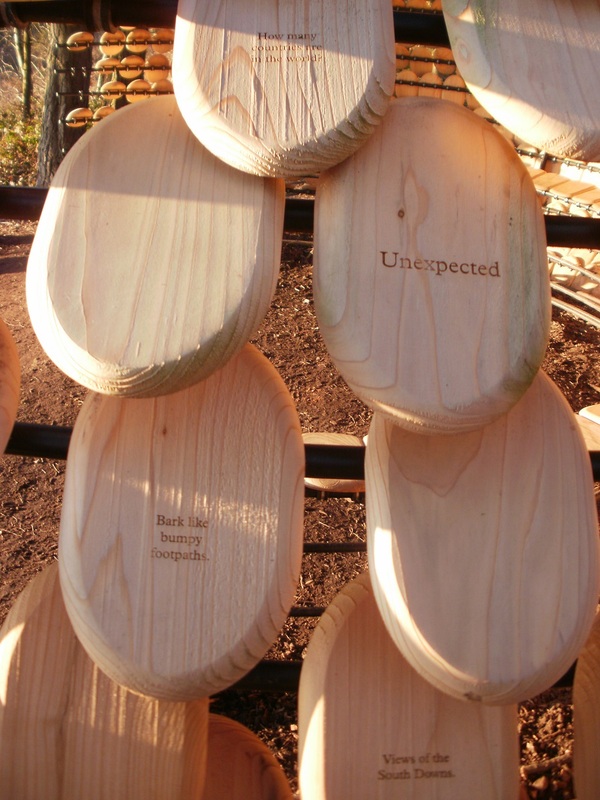 •	There are awards, which can be displayed on your geocaching profile page, your blog, or elsewhere, which show how many Church Micros you have found. We are currently a Deacon (25-49 finds). Woking Wonders have been elevated to Saint (5000+ finds). •	Church Micro Day is on 7th November, the anniversary of the placing of the first Church Micro in 2007. 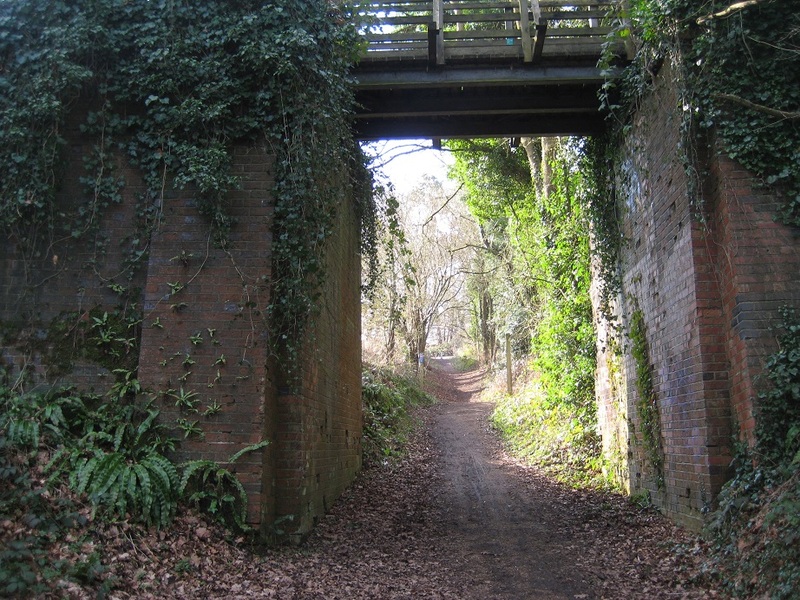 •	Number 1 in the series is at Earlswood, near Redhill in Surrey. 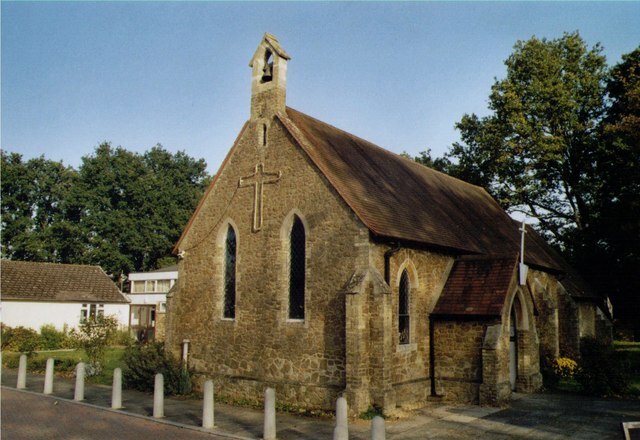 •	‘Notable’ numbers often have notable churches to go with them – e.g. Church Micro 3000 is St Paul’s Cathedral, Church Micro 4000 is Westminster Abbey, Church Micro 8000 is Fountains Abbey, and Church Micro 9000 is Leicester Cathedral. •	But Church Micro 666 isn’t located close to any church. 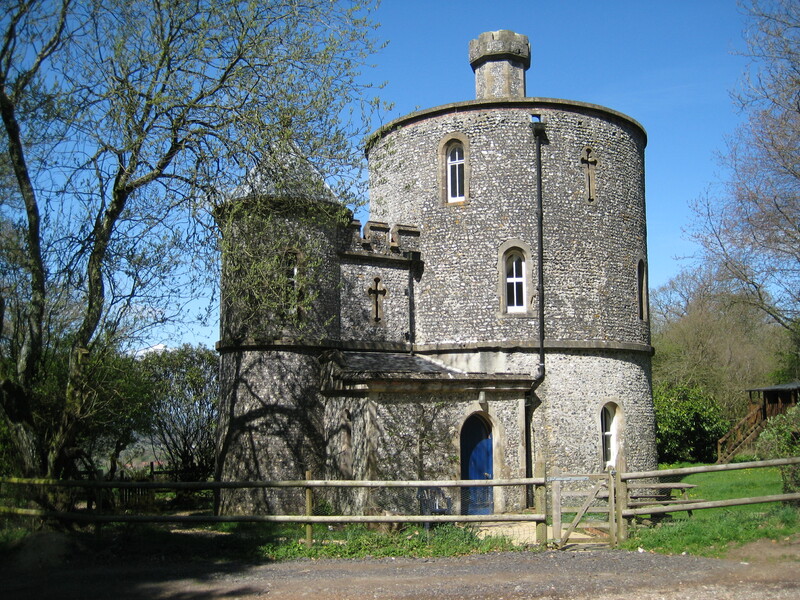 The cache container IS a church (a model, or so we’ve read, as we haven’t found it … yet …) Appropriately, it is located near the Devil’s Dyke in Sussex. 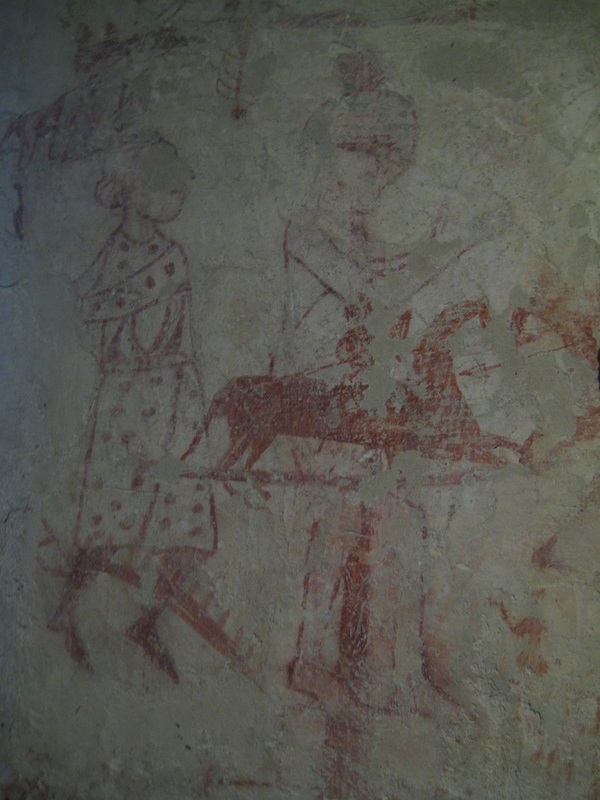 •	Many are multicaches – typically, a look at the church notice board is needed, then the cache coordinates can be derived on the numbers to be found there – we were rumbled, once, by a zealous churchwarden while doing this! •	Most are small, as the name ‘micro’ would suggest, often 35mm film canister size. But not all. The Church Micro in Sandhurst is very large indeed, and was filled with all sorts of interesting things when we visited it during Leap Year weekend a couple of months ago. But the (gone missing) cache it replaced was not at all large. 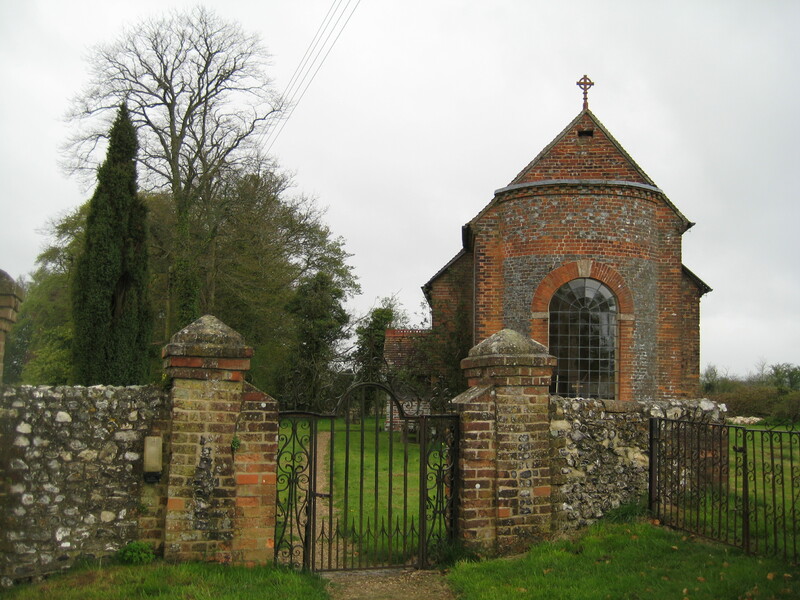 •	Some of our favourites are associated with old, small, and rarely used churches at: Imber (number 3210, in Wiltshire), Inglesham (802, in Gloucestershire), Boveney (6300, next to the Thames in Berkshire) and Wiggonholt (4507, in Sussex). •	Others have interesting people buried in the churchyard: Binstead (number 853, Field Marshal Montgomery), Nuffield (3723, David Frost), and Pirbright (938, with a memorial to Henry Morton Stanley, finder of David Livingstone). 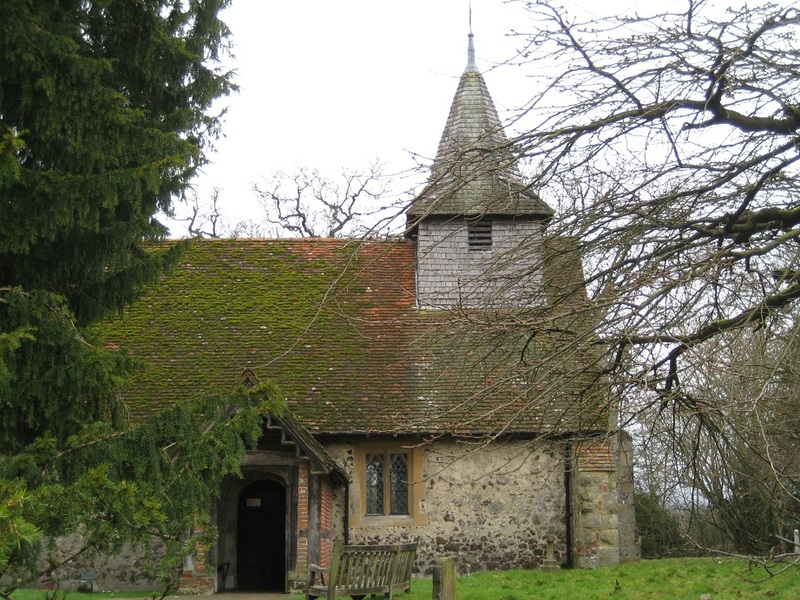 Or else they have interesting customs associated with them: Cheriton (number 1879, in Hampshire, where a ‘dole’ is given out to deserving parishioners). 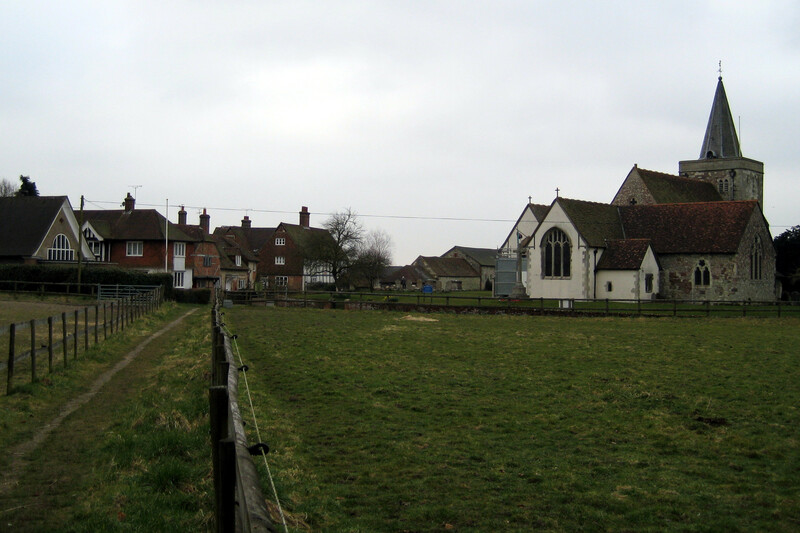 Church Micros are a good way to find out about the history of an area and its people. And – a very important plus point – there is often a seat in the churchyard where rest and refreshment can be taken! 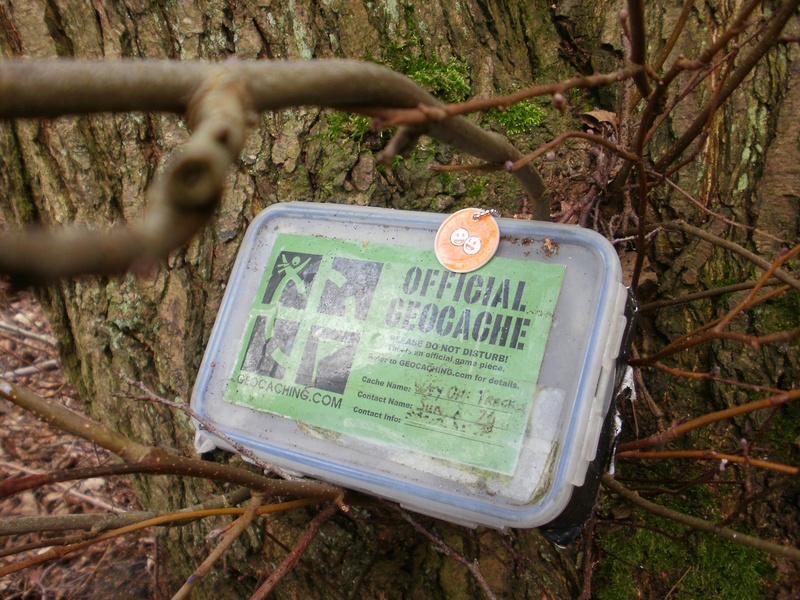 Up to now, many of our routes have been following a laid out geo-caching series. For a change, and because we wanted to stretch our legs a bit more, we followed a Walking route, published in Country Walking magazine, and found the caches near to it. 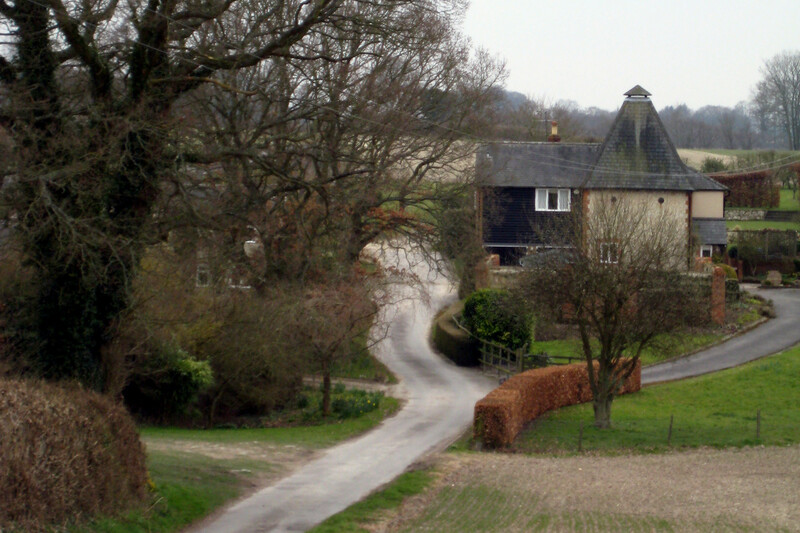 The route started in the small Hampshire village of Ashmansworth, followed some roads and footpaths to Crux Easton, then onto Woodcott before rising to the top of a chalk ridge and following the Wayfarer’s Walk back to Ashmansworth. 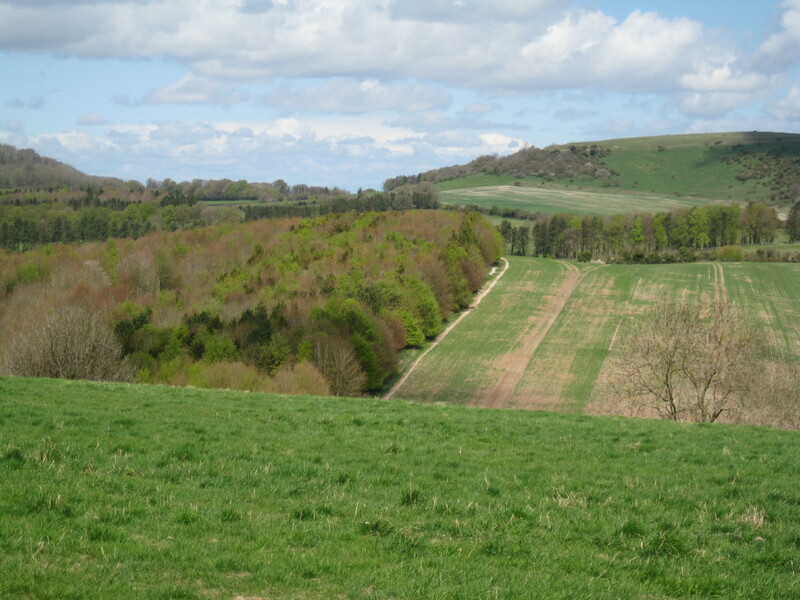 We discovered that were 10 caches over the 9 mile route – so it meant we really could stretch our legs between caches. Of the first three we found, 2 were part of the National Church Micro series. 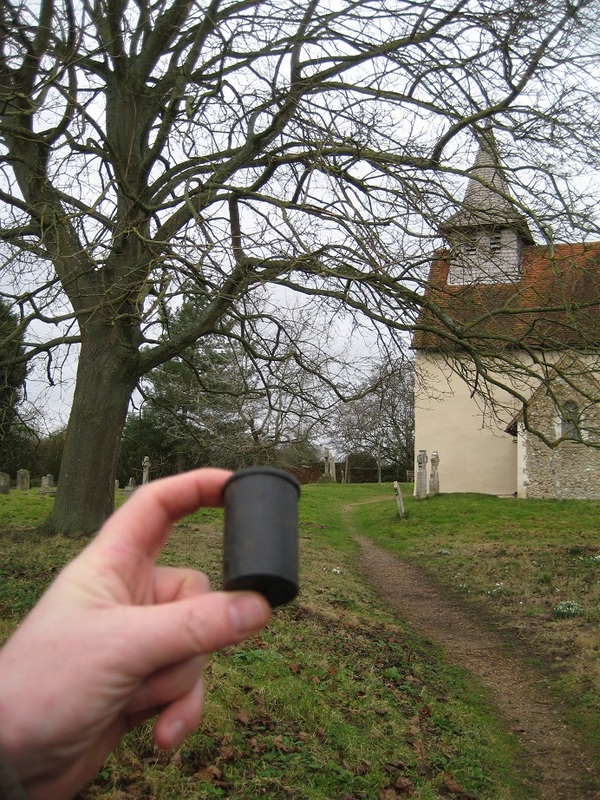 These are small caches, placed near churches. Frequently they are multi or offset caches, where the published co-ordinates take you to point A, where you must find out a piece of information, use the numbers in the information to find a new set of co-ordinates at point B. The cache is generally within 200 yards of point A! 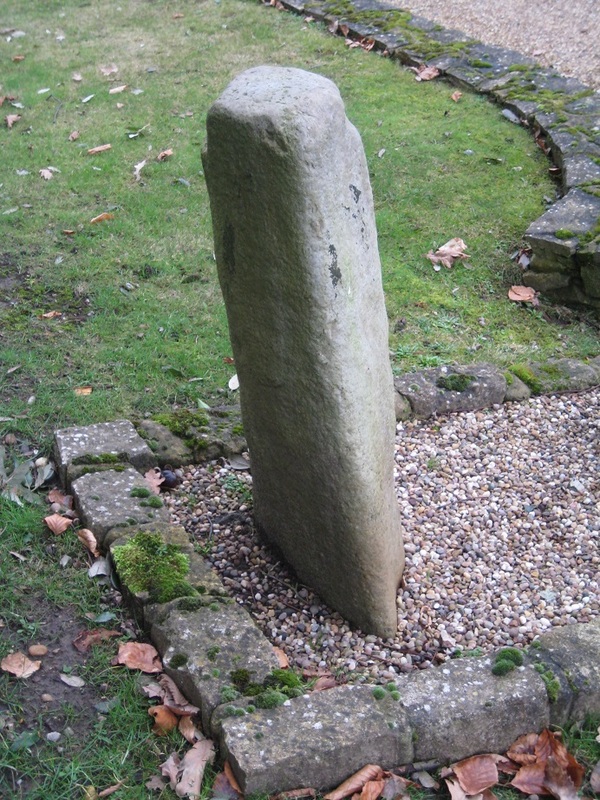 At the first cache, the main co-ordinates had to be derived from a date on a gravestone. This gravestone stood out as it had a shamrock carved on it. While we were deriving our final co-ordinates for the cache it rained, so we were grateful that the church provided us with shelter. Our walk continued, at one point almost being run down by a set of speedy cyclists, and we found an extremely large cache as well as the small Tupperware containers we have become accustomed to. As we climbed up to the ridge, we espied a group of walkers who stopped part way along the Wayfarers Walk. Our GPS indicated that where they had stopped was in the vicinity of our next-but-one cache…. were they cachers ? We walked hurriedly to our next cache, found it and replaced it but could not escape from Ground Zero (GZ) quickly enough before the other cachers arrived! We said ‘hello’ and they had retrieved the cache before we were out of sight. 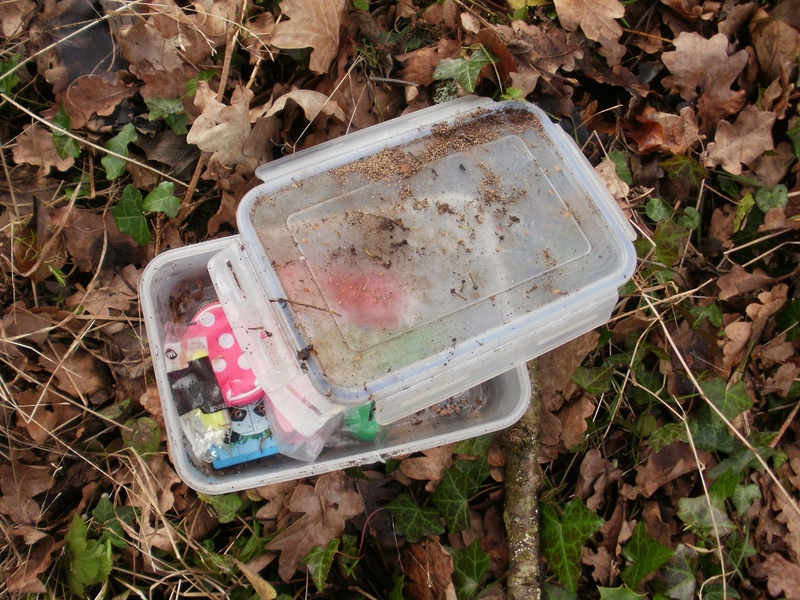 The Wayfarers walk yielded all our remaining caches, including using a spent cartridge as a container! High on the chalk ridge there were splendid views and in the distance we could just make out Highclere Castle (aka Downton Abbey). 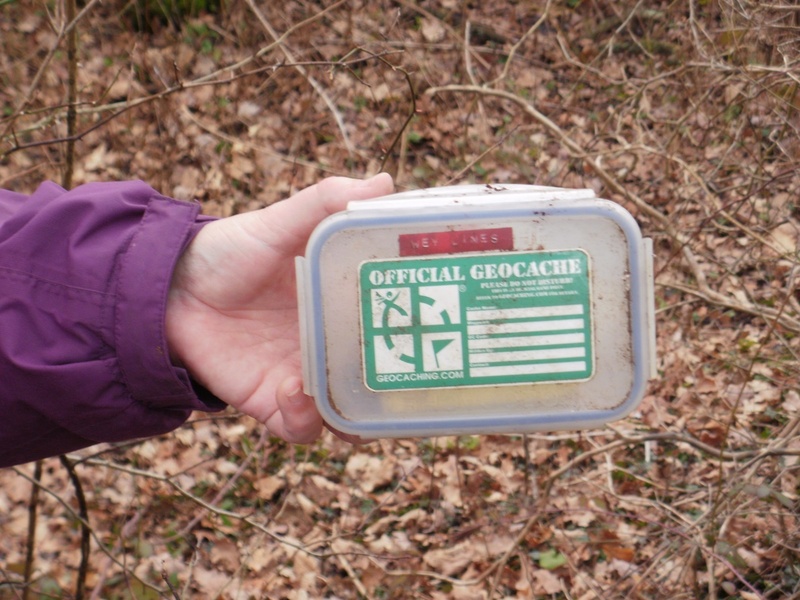 A great day out, and all 10 caches found! There are many ways to find a cache. During the year we will explain each that we use and we start with two : Traditional and Multi-Cache. 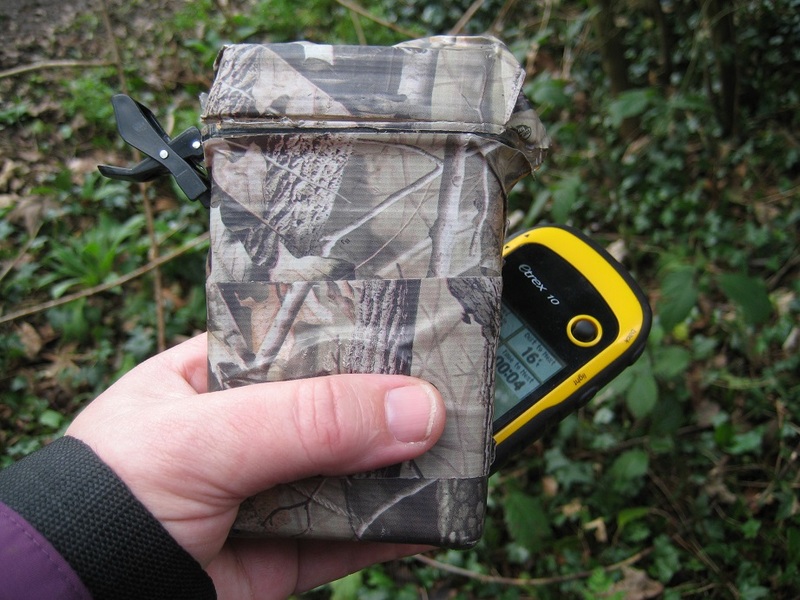 The first, Traditional, is where a published set of co-ordinates takes you to the exact spot where the cache is hidden. The second, Multi-Cache, is where the published set of co-ordinates takes you to a place where there is a supplementary clue(s). Using these clue(s) will yield the co-ordinates for the actual cache. 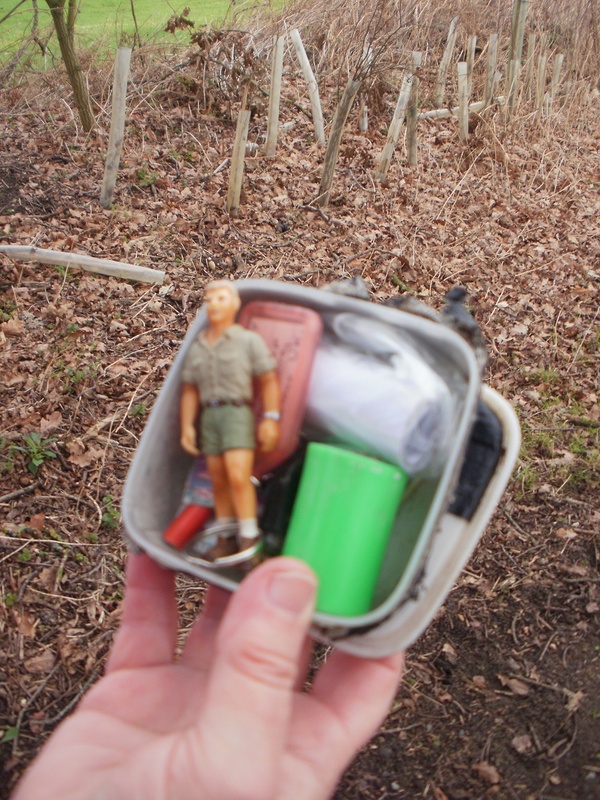 Our first successful cache of the year was a Multi-Cache (our first!). 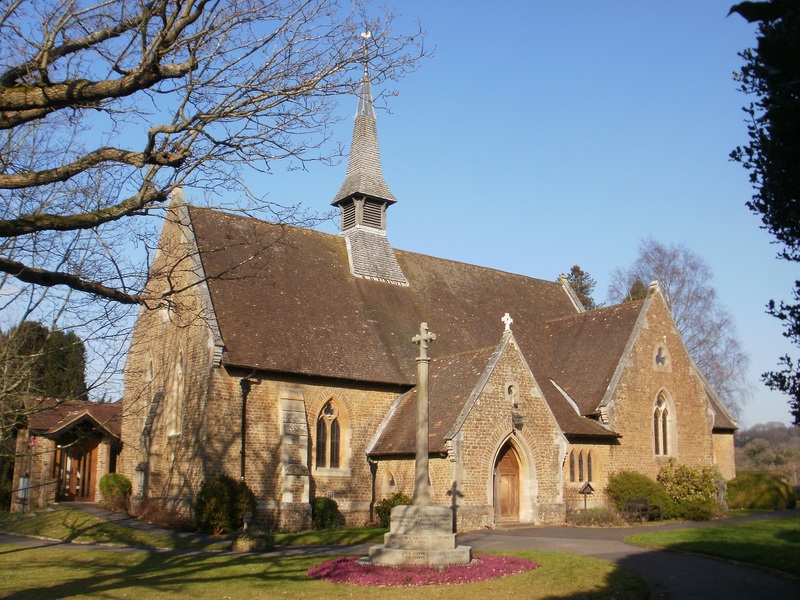 The first set of co-ordinates took us to St Michael and All Angels Church in Sandhurst. Using a phone number on the Welcome Board, we very quickly found a nano magnetic cache yards from the Church. 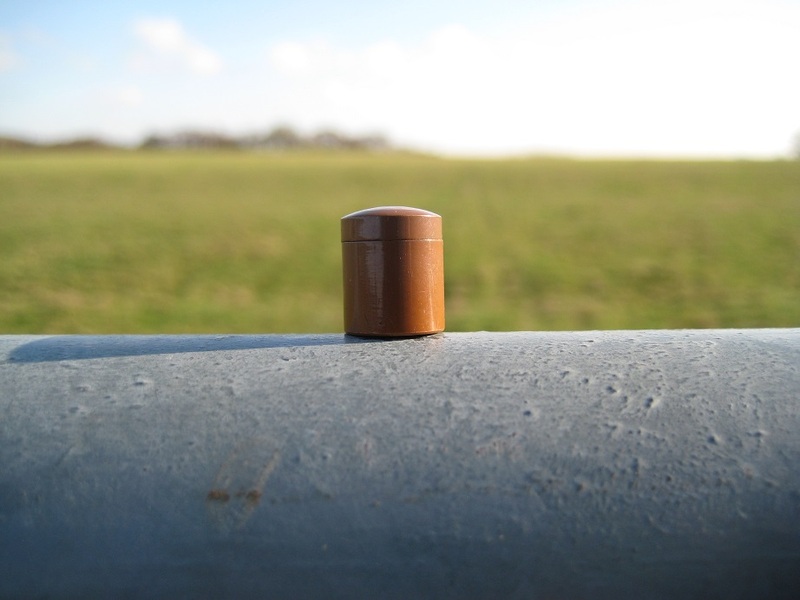 Nano caches are very small, not much bigger than a fingernail, and only contain a small rolled sheet of paper as a log. Once signed the log is re-rolled back into the cache – this is very fiddly! 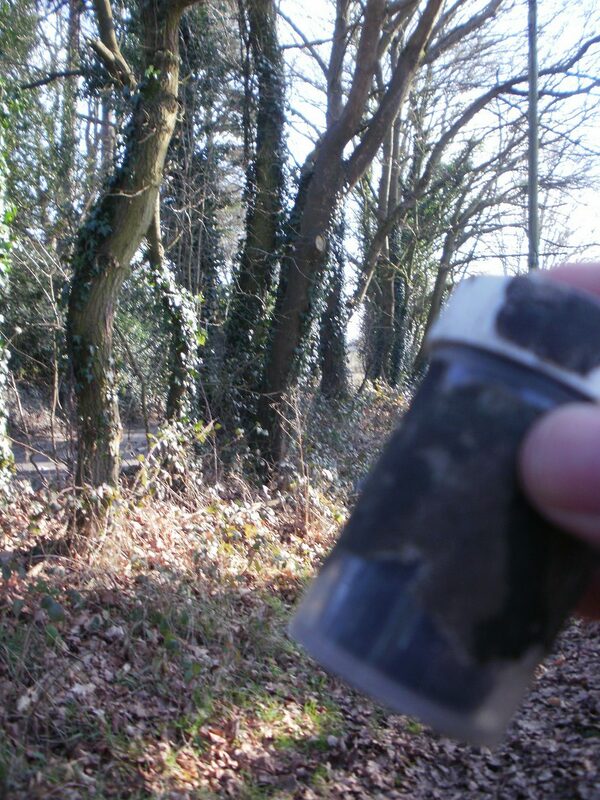 Our second cache of the day was a traditional find, a micro cache (film canister size) . Sited on the outskirts of Yateley’s Sean Devereux Park, it was a fairly quick and easy find. We didn’t explore Sean Devereux Park (you can read about Sean Devereux here http://en.wikipedia.org/wiki/Sean_Devereux ) but the sporting facilities in the Park looked extensive. 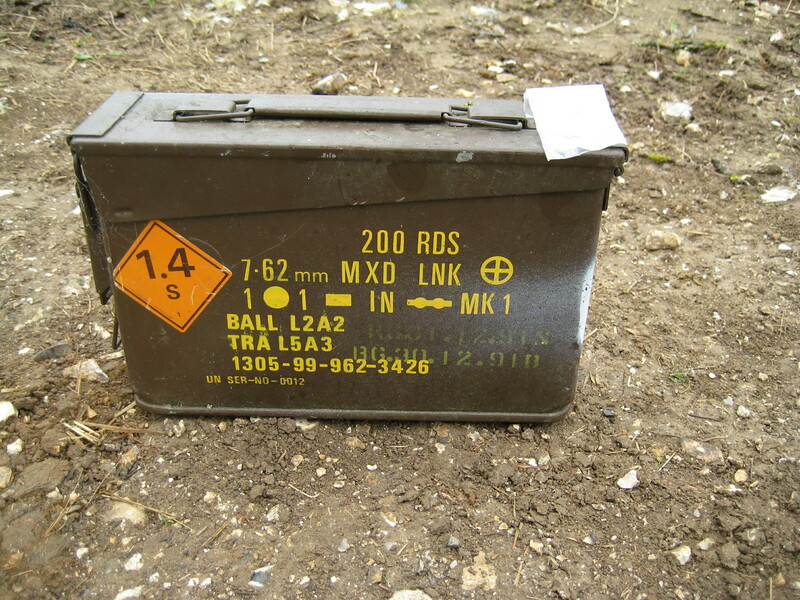 Our third cache was in the middle of a small wood close to the B3732 on the outskirts of Yateley and was a large Tupperware container containing lots of small treasures. Two of the treasures were ‘trackables’ – where a previous cacher had sent a trackable item on a mission. We retrieved the trackables – but without internet access – were unable to find out their missions until we returned home. 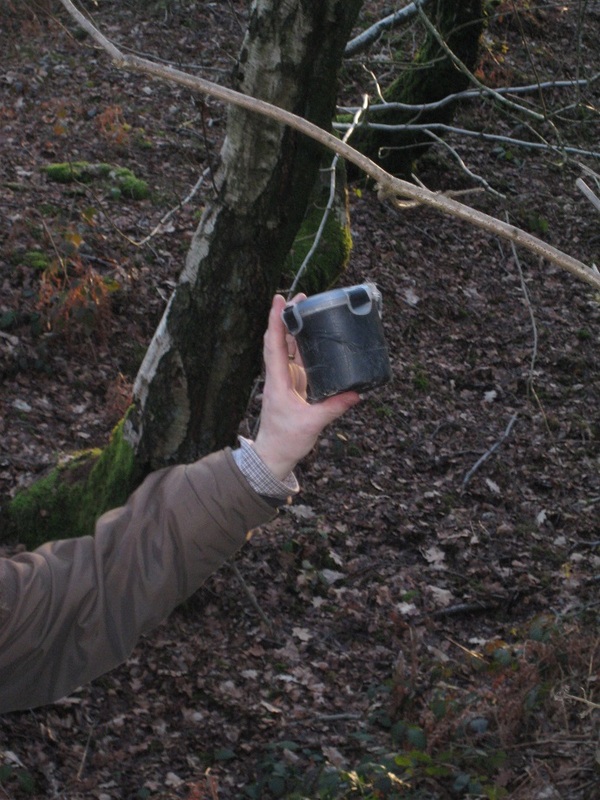 So a good start to the New Year – one day gone, and three caches found… our quest was started!